The ultimate in space-action games returns! 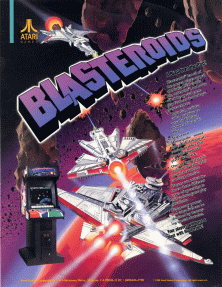 Blasteroids is an updated version of one of the most successful games in the history of the industry, Asteroids. By taking the highly successful game concept of yesterday and combining it with the technology of today, Atari has created a unique attraction for a new generation. Players blast their way through four different galaxies filled with asteroids and other challenging obstacles. After clearing each galaxy, the player meets up with Mukor, the green slime monster. Mukor taunts the player with one of several voice phrases, including "Now you die, human." 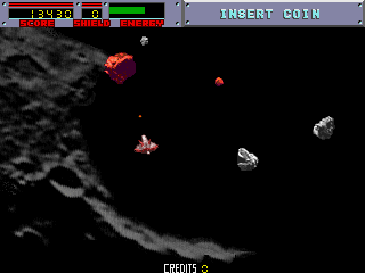 The player can choose from four different starting difficulties, based on the four galaxies he must conquer. At the end of the game the player is presented with the ultimate challenge against Mukor.